US$ 990 / person ? 1 Guwahati – Samdrup Jongkhar – Tashigang Early morning at 5 o’clock you will be picked-up in Guwahati, driving to Samdrup Jongkhar. Here you will meet your Bhutanese guide and driver, who will manage all immigration formalities. Then you will start all day drive ascending to the Himalayas. After few hours drive we will stop to get blessing from Hindu hermit for safety of our journey. Soon after you will have opportunity to visit first of many charming Bhutanese Buddhist temples, called Zangto Pelri Lhakhang, with detailed mural painting. During afternoon, you will stop in Khaling village to visit National Handloom Development Project, which maintains rich tradition of local weaving. Also, you will pay a visit to the National Institute for the Visually Impaired. One of the accomplishment of this progressive institution is the development of Bhutanese version of Braille's script. Along the way, you'll also pass by Karma Thegsum Dechenling Goemba, huge monastery school and Sherubtse College, first Bhutanese university campus established in 1978. Also, we visit temple in nearby Kanglung village. Reach to Tashigang in the evening. 2 Tashigang – Tashiyangtse – Tsengkharla Morning visit of Trashigang dzong which was built in 17th century and has commanding view of the valley. Inside are few interesting temples and local government offices. After that, you'll take about 2 hours drive time to Trashi Yangtse. Pass around the Gom Kora temple, which you shall visit next day before the trekking start. Further drive will offer occasional views of snowy mountain in clear weather. Finally, you will see impressive building of the old Trashi Yangtse dzong which is home to 300 monks. The dzong used to protect former trade route with Tibet and was established by the saint Pema Lingpa of 15th century. Near the Trashi Yangtse is the famous Chorten Kora, the largest stupa in Bhutan built in Nepali style. This is the site of two colorful local festivals at the beginning of the year. In winter season it's worth to continue drive to Bumdeling birds reserve further to the north as the rare Black Neck Cranes might be spotted here if you're lucky. Trashi Yangtse is also home to National Institute for Zorig Chusum, the school where the young people learn the art crafts of their forefathers to keep Bhutan's traditional arts alive. Then drive slightly back to Gom Kora, the place where 8th century magician-saint Guru Padmasambhava left his body imprints. Continue drive to Tshengkharla in altitude of 2040m. Here you will spend first night camping. 3 Tsengkharla – Omba Trek 14km, 5 hours, ↗500m, ↘540m. In Tsengkharla you can see the ruins of the dzong (castle), allegedly the first to be ever built in Bhutan, by exiled Tibetan king Lhasey Tsangma in 9th century. Here we start the trek. On the way, we will take light pack lunch. The narrow trail will take you around several temples and through maize fields. On the way see Septshekhang Lhakahng on the rocky cliff. Finally, descend through fields and forest to Omba village. Here is the simple guest house where you will spend the night (subject to availability, if rooms are out, you might need to camp). Visit neat village and enjoy the scenic surroundings. Sleep in elevation of 1920m. Trek 11km, 4-5 hours, ↗440m, ↘200m. 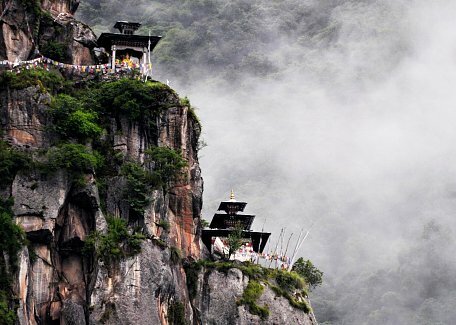 Omba Nye is the monastery, which is called "Tiger's Nest of the east" for its similar setting on the rocky cliff. This day you will start by hike up to there. It's said that 8th century magician-saint Guru Rimpoche had meditated here for 2 months subduing the demon whose name was Phurba Trashi. Various imprints of Guru Rimpoche can be found on the way. After reaching the temple see the holy places and then continue slowly descending and finally reaching the village of Jangphu. Another farmhouse, where you will spend a night is available here. Sleep in the elevation of 2130m. Trek 21km, 7-8 hours, ↗250m, ↘1350m. Today will be long day walk reaching back to road. You will go around fields and forest, crossing Old Kheni village and continue to Gongza Gompa, another holy and very peaceful place built beside the mighty Gongri river. Many interesting relics are to be found here, such as demon's heart, shoe of Guru Rimpoche and devil's egg. Finally, reach the road head at Doksum. The car will be waiting for you here and will drive you back to Trashigang. 6 Tashigang – Samdrup Jongkhar and onward to Guwahati This will be all day drive descend from the Himalayas southwards to Indian border. You will start early in the morning, going the same way you came here on the day one, going around Yongphula airport and Sherubtse university. Don't forget to stop for another blessing at Damthang before reaching Smadrup Jongkhar. After immigration formalities, you will tell good bye to your Bhutanese guide and driver and Indian counterpart will drive you to Guwahati. This is the tour end.